Madrid (Spain) – June 14, 2017 (travelindex.com) – An aggressive smear campaign full of innuendo, allegations if not outright defamatory comments unfolded over the past weeks since the election of a new Secretary General for the UNWTO did not bring the wanted result for a media organization, which reputation itself is now soiled and increasingly discredited. Allegations can work both ways and multiple sources have suggested that money could be behind the media organization’s support for one particular candidate at the time, who however lost in the second round to the Georgian candidate. The question must therefore be asked: ‘Who paid you and how much‘, not that a truthful answer can be expected. Support for Mr. Zurab Pololikashvili however came largely as a result of the majority of members on the Executive Council of UNWTO being fed up to the teeth with the maneuvers behind the scenes by the African Union to blackmail the Seychelles to withdraw their support for Mr. Alain St. Ange or else face a range of immediate sanctions. While the AU has not come clean on their mischievous moves nor explained the shoddy unsigned document handed to the Permanent Representative of the Seychelles to the African Union in Addis Ababa, has that only fueled speculation that a sinister anti Seychelles campaign unfolded behind closed doors, aimed to keep a white African out of a job he was literally certain to get. UNWTO, in a sign of being fed up too with the constant allegations and insinuations, has now issued a statement about this trend, which is clearly aimed to influence the Annual General Meeting of UNWTO which must endorse the election of Mr. Pololikashvili at its 22nd session in China later this year. 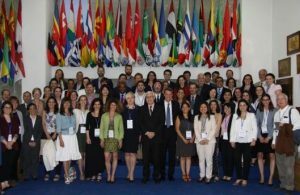 The process of election of a nominee for the post of Secretary General of the World Tourism Organization (UNWTO) for the period 2018-2021 that took place at the 105th Session of the UNWTO Executive Council on 12 May 2017 in Madrid, Spain, was conducted in full observance of the Organization’s Statutes and Rules of Procedure, including the Presentation by the Candidates, the Restrictive Private Meeting for discussion of the Candidates and the Normal Private Meeting for vote by secret ballot. The various statements published by eTN are not only inaccurate but highly defamatory. As per the UNWTO Statutes and Rules of Procedure, the 105th Session of the UNWTO Executive Council selected one nominee to the post of UNWTO Secretary-General (Mr Zurab Pololikashvili of Georgia). The recommendation of the Executive Council of the one nominee will be submitted to the 22nd Session of the UNWTO General Assembly for his appointment to the post of Secretary-General in accordance with Article 22 of the UNWTO Statutes. In the name of truth and accuracy, UNWTO requests eTN to publish the above statement in its full content. It is expected that UNWTO will sever ties with the media organization in due course.